‘Cause this belly’s just too delicious for ya babe. This is one cut of meat that really can’t do any wrong. Firstly, it’s incredibly economical. Why? Because it’s kind of fatty. But that’s okay since it’s the fat that keeps the meat so meltingly tender when cooked low and slow, and that is what we want! Besides you’re not under any obligation to eat the fat if you don’t want to. No contract to sign here. Let it do it’s thing in the oven, then send it packing and what you will be left with is a mountain of tender, juicy meat. Another perk of belly pork is that it also comes fully equipped with an earth shatteringly crunchy layer of crackling if cooked correctly, but that’s pretty easy to accomplish and I’ll show you how. Put the coriander and fennel seeds into a mortar and grind together with the pestle until crushed. It doesn’t have to be ground to a very fine powder though, just pound it enough to release the nice aromas from the spices. If you haven’t already had the meat scored by your butcher you can do it easily yourself so long as you have a very sharp knife. Stanley knives work well here, but just be careful not to cut through the meat itself. 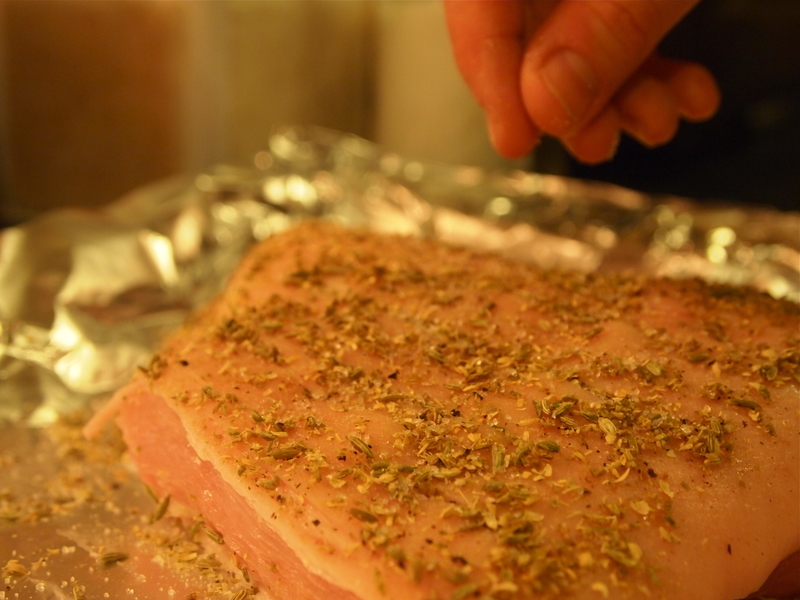 The aim is to make long cuts only through the skin as this helps with the crackling, makes it easier to break into pieces at the end and means the spices can cling more readily to the surface which simply adds to the flavour! Rub the skin with salt, pepper and a little more than half of the cracked seeds, getting the seasoning right into all the cracks. 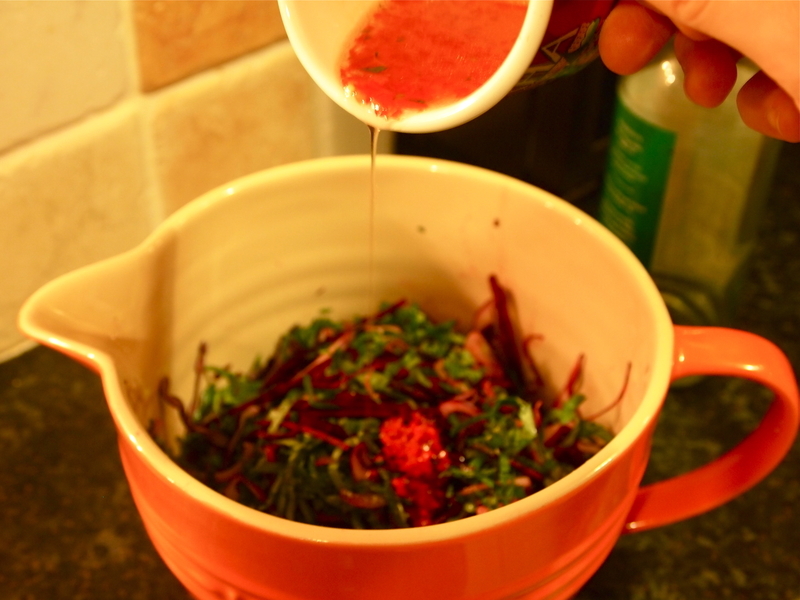 Scatter the remaining seeds into a roasting tin and put the meat on top. Put into the preheated oven and roast for 30 minutes, then turn the temperature down to 180C/Gas Mark 4 and cook for about 1 1/2 hours, until the juices run clear when the meat is pierced with a skewer and the skin has crackled to a beautiful golden brown. The reason for initially cooking it at such a high temperature is to give the crackling a good kick start, but if you don’t think it has crisped up enough at the end of the total cooking time, then just bang up the heat again and put the pork back in, checking it every few minutes until it has crisped up properly. Leave to rest, uncovered, for about 20 minutes or so. Remove the crackling from the pork before carving, then cut the joint into thick slices and break the crackling up into portions. 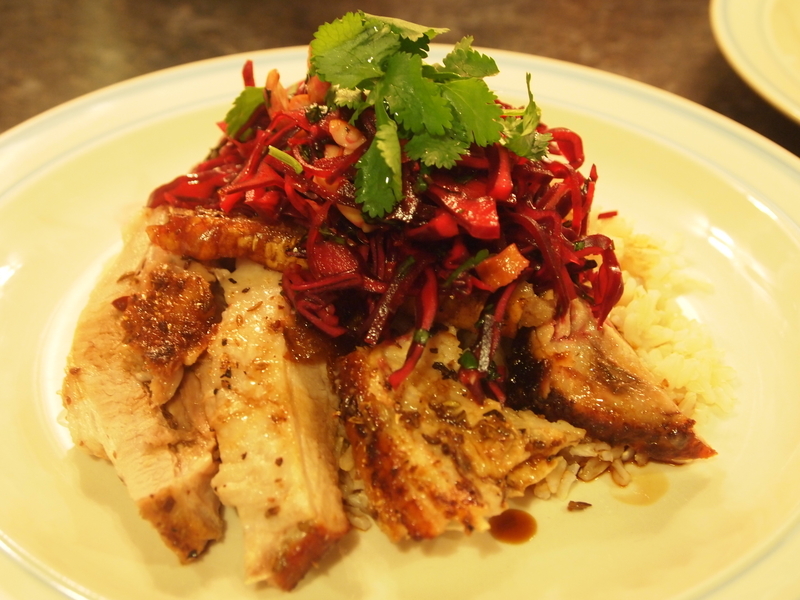 I served the belly pork with some plain brown jasmine rice and a nice fresh shredded salad of beetroot, red cabbage, red onion, toasted cashew nuts and coriander and dressed it with a mixture of rice vinegar, a little soya sauce, mirin, finely chopped red chilli, sesame oil, sugar and a small pinch of salt. 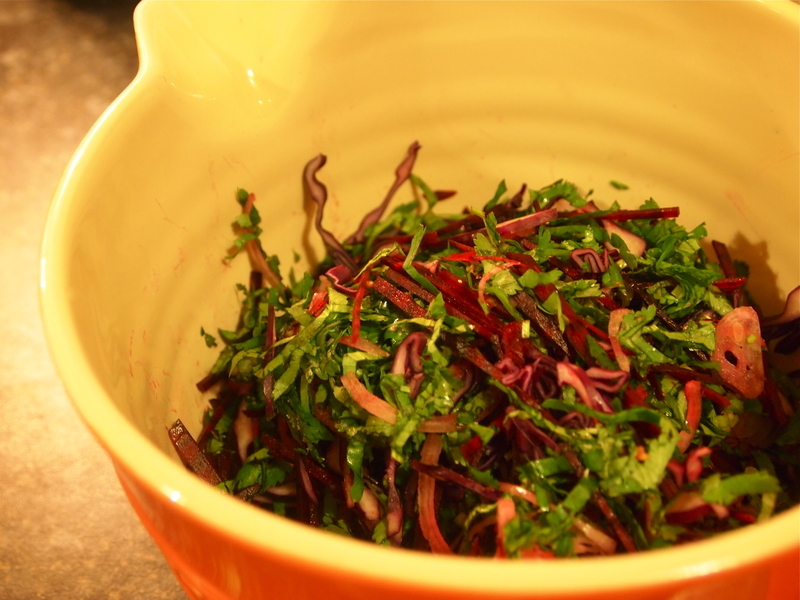 This shredded salad (or ‘slaw’, if you will) provided a lovely crunchy, zingy contrast to the rich pork which was most welcomed. Belly pork is also wonderfully versatile, so can be served in lots of different ways. With rice, as I have done here, but even more classically, with mashed potatoes, apple sauce and steamed greens or cabbage. The deciding factor though, is that even Destiny’s Child agree with me about how good this is. Let me refresh your memory.. “Spotted me a tender thang“, “Lookin’ hot, Smellin’ good“?! They’re talking about PORK! And all that talk about ‘jelly‘? Well, that’s just fat. Obvs. Either way, it is just too good to not give it a whirl. Go on, do it for Beyoncé. They were right you know, I don’t think I can handle how tasty this is. My mouth is watering just thinking about it!